Two-Factor Authentication is a method to verify the identity of the user logging in by adding an additional security layer to the log in. This is done by supplementing the username and password with an additional code that is unknown to the user. This code is unique for each login attempt and is automatically sent to the phone number of the user as an SMS once the username and password have been submitted. The verification is valid for 1 hour from the time it is sent. Adding an additional security layer ensures you that sensitive data, e.g. the details of your employees or customers, stays secure. You might have contacts from many customers, employees and other sensitive information stored in your account. Do not risk anyone unauthorised to access that information. A standard “password only” approach can leave you vulnerable to cyber attacks. Statistics show that 90% of employee password can be cracked within 6 hours and 65% of people use the same password everywhere which makes passwords unreliable when used on their own. Combining the password with a two-factor authentication the attacker needs a physical device (mobile phone) to receive the security code. This makes a security breach much harder. 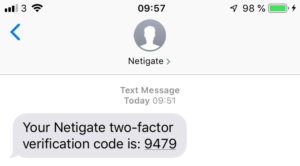 How do I add Two-Factor Authentication to my Netigate account? It is simple and easy to set up a Two-Factor Authentication. First of all, you will need to have the function enabled. Ask your contact person about it and they will help you get started. Once the function has been enabled, all you need to do is add a phone number for each user in the user management menu. Now each login attempt prompts the user to enter a verification code, which they receive to their mobile phone once their personal login details have been submitted.